MAYUMI : words / vocalist. MIZUKI : words / vocalist / Model / actress NAOYA: composer / keyboard. Is a 3 member Soul music unit which not only produces their own music but other artists. Lead singers Mizuki and Mayumi, both established artists in their own right, came together to form their own unique groove with the help of producer Naoya. 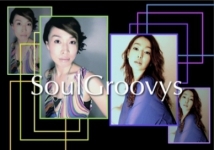 With beautiful vocals and harmonies SoulGroovys is an up and coming group not to be missed.